No matter what you think about the legality of abortion, “Unplanned” will get under your skin. The new movie, which opens this weekend, is a dramatization of the true story of Abby Johnson’s conversion from Planned Parenthood clinic director to pro-life activist. “Unplanned” invites an empathic response by showing the messy parts of Johnson’s life—including the two abortions she had in her early 20s. “When I watched the film the first time…I was like, why did I decide to do this? This feels so vulnerable,” Johnson said before an early screening of “Unplanned” at The Sheen Center for Thought and Culture. This feeling of uncomfortable vulnerability reflects the experience of watching the movie. As Johnson’s story unfolded, I felt with her, and I felt it in my stomach. God plans our steps from conception. It was difficult to watch too. These graphic moments are not gratuitous but are aimed to subtly move people. And Johnson’s story offers a different way of discussing abortion—one in which it is possible to see how complicated the issue can be. Perhaps, the ardent pro-choice advocate can be convinced to entertain doubt, or the passionate pro-life protester can be persuaded to see the humanity of the Planned Parenthood employee. 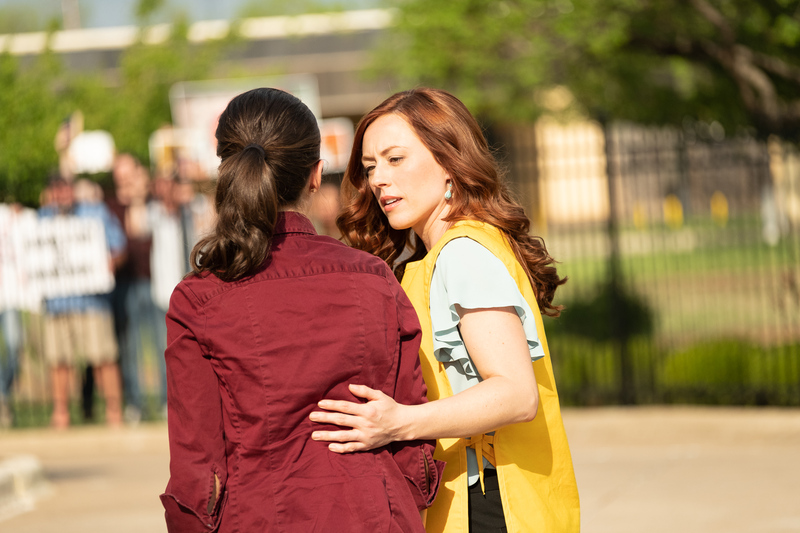 A key motif in “Unplanned” is the fence that surrounds the Planned Parenthood’s parking lot, separating the clinic from those engaged in sidewalk prayer and protest. Despite the ideological and physical divide, Johnson, after years of prayers and pleas from members of the Coalition for Life in Bryan Texas, moves to join the protesters. I watched the film less than a month after New York revised its abortion laws, removing abortion from the criminal code. It was screened at The Sheen Center, a Catholic arts organization aimed at “featuring humankind as fully alive.” It is next door to Planned Parenthood’s Margaret Sanger Health Center. It felt like there was an impossible divide between those two buildings. Underlying Johnson’s story and the people who brought it to life is a real sense of providence. Johnson’s leaving Planned Parenthood was not the Coalition for Life’s only victory. The clinic Johnson worked at until 2009, first as a counselor and later as director, closed in 2013. The Coalition for Life became a national movement, now called 40 Days for Life. “Unplanned” is the story of these pro-life victories, based on Johnson’s book. I signed on to really show people that this is God’s story. Abby Johnson worked at Planned Parenthood. Now she is a leader of the pro-life movement. Margaret Sanger was a eugenicist. Why are we still celebrating her? When Bratcher did tell her mother, she learned something that changed her outlook not only on the movie but on life itself. Bratcher’s mother confessed to her that she had gone to a clinic again as a 19-year-old seeking an abortion. She had changed her mind in the exam room, walked out and chose to be a mother. As a result of that choice, Ashley Bratcher was born. Are there stories about people who are not leaders? Is there a relationship between being-seen and startling and newsworthy transformations? I think it an interesting question. "God plans our steps from conception"? So, no free will? I was a volunteer at Planned Parenthood and Johnson's version of what happens there is nothing like what I experienced there. It would be really refreshing if for once there was a movie about an unplanned pregnancy that wasn't a conservative religious pro-life propaganda commercial. There aren't a whole lot of pro-life movies out there, which partly explain why the US is so fringe left on abortion in terms of policy. Most volunteers at most charities are shielded from the reality of what goes on inside. Unless you are on the board, you usually don't see much. There is a concerted effort to bury this movie. Twitter had banned the account (latter reinstated after protests). The networks will not accept ads for the movie. Perhaps that's because the byline for the movie could be "disgruntled employee switches sides to cash in on extremist pro-life wave in flyover states". Religious conservatives do love their repentant sinful women. Hi Crystal, Iwould be interested to know if you saw the movie. From what I gathered from the movie if Abby had stayed a volunteer she would never have seen what was going on and I would think most volunteers would never know! Her experience changed as she moved up to Director. And as a side: I believe in man’s free will. 1) I worked one summer as a volunteer. Fist I worked in the office answering phoned in questions. Later I worked as an aide in the vasectomy clinic. I wasn't "shielded" from anything. There was nothing "secret" going on. Abortion is a legal medical procedure, not some arcane diabolical rite hidden from the public. Of course, unless you worked in the clinic you would not be watching a procedure - medical procedures are not public events. 2) I find it incredible that Johnson worked for PP and yet had two abortions herself. How is it possible she was unaware or uncaring about unplanned pregnancies, when the major job of PP is contraception? Excellent story ! Well, some americans wonder why Margaret Sanger is still being celebrated ? As a non-american catholic I wonder why our hierarchs still believe and almost all of our universities teach such an irrational and anti-scientific hoax as macroevolution ? Darwinism is the source and heart of all sorts of "Sangers" and "Singers" ! Emma Winters is a Joseph A. O’Hare, S.J., fellow at America.